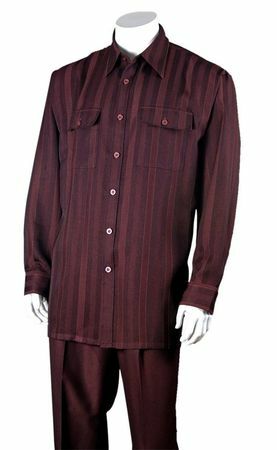 Let your style come alive full force with this burgundy stripe long sleeve walking suit by Fortini. Featuring a fine textured pattern fabric style with baggy double pleat pants. The shirt has double chest pockets with flaps that make a statement all it's own. This casual outfit will look great on you. Fabric is Poly.